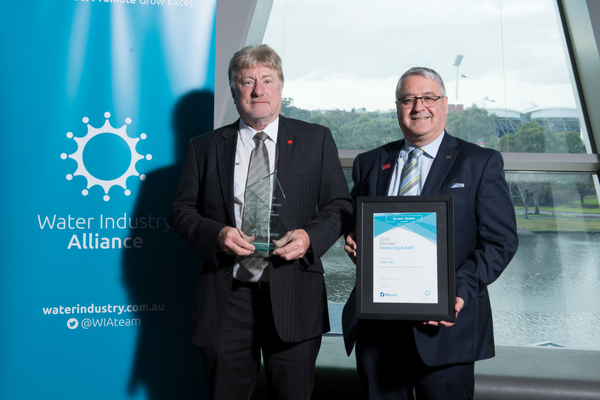 The South Australian based water treatment company Hydro-dis was awarded the Alliancing Award at the Ceremony on Friday 6 July for its India Demonstration Unit. “The Award was quite surprising to be honest, we were up against a really good-quality field and we’re pleased to have won it,” Hydro-dis Managing Director Mark Carey said. “I think it’s recognition that what we’re doing is ground-breaking in terms of taking new technologies from South Australia to India, especially in the very sensitive areas of water disinfection and water treatment. The judges commented that the collaborative approach taken by all parties involved in the project demonstrates the benefits and importance of the private and public sector partnership working together. The Indian market is an extremely difficult market for companies to enter and a concerted effort by many partners has contributed to their success. The success of Hydro-dis lays the groundwork for other companies and organisations to work in India and will benefit the whole water industry. Hydro-dis Managing Director Mark Carey (R) and Engineer RobRichardson at the 2018 Smart Water Awards.